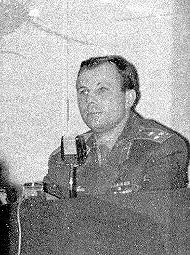 During the days 1-3 March 1964, Yuri Gagarin and Valeriy Bykovsky were in Sweden on a "propaganda" tour. They lectured at the Royal Institute of Technology on 2 March and met the king (Gustav VI Adolf) on 3 March. This was a rather big event in Sweden, and I actually went to the airport to see their plane arrive. I have never done that again, not even for arriving celebrities like the Beatles,... ! For Gagarin I went - you do not get many such celebrities! 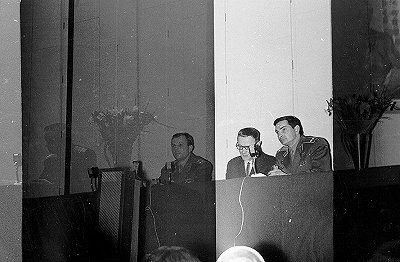 The cosmonauts also made a public appearance at "The People's House", a great auditorium just across the street from my school. One of the co-sponsors of this event was the Swedish Interplanetary Society (SIS). So, naturally, I went there to see these word-famous guys! I had brought my Russian Zenit camera. 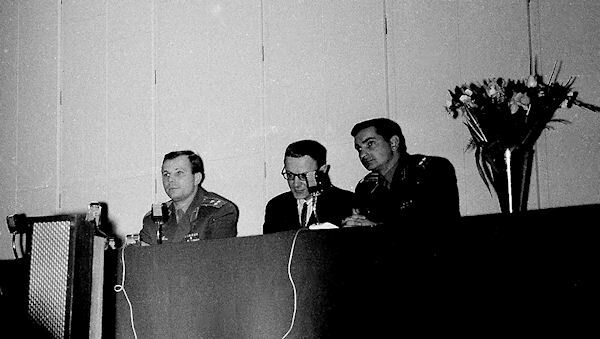 It usually worked fine, but this day its film feed mechanism jammed and the only picture I got of Gagarin and Bykovsky and their interpreter was the one on the left. An added misfortune is of course that Gagarin is dark while Bykovsky is clearly seen! What did these two space-farers talk about on this day in March 1964. Well, there was not much of substance in terms of technical information, but they kept stressing the theme that the future of spaceflight would be manned orbital stations for observing the sky and the Earth! This is one of the clearest memories that I have of this event and how disappointed I was that they did not announce that the Soviet Union would compete with Apollo. Another clear memory that I have is that both Gagarin and Bykovsky were really short fellows.They did not look they way I imagined heroes to look! and I saw him in real life! PS: Recently, some twenty years after I wrote the text above I found the negatives of the picture above.